10년이 넘도록 그동안 중단되었던 뉴저지 한인 연합감리교회 목회자 신년 하례 예배와 만찬이 뉴저지 여선교회 연합회 주최로 지난 2월 19일 베다니 교회에서 은혜 가운데 아름답게 행사를 마쳤습니다. 많은 목회자님과 사모님들께서 기대 이상의 정성스런 섬김에 너무 기뻐하셨습니다. 목회자 협의회 회장이신 체리힐 교회의 김일현 목사님의 인사 말씀 중에 앞으로의 여선교 회원들의 각 교회에서의 헌신과 봉사로 더욱 하나님께 쓰임 받으며 선교에 사명을 잘 감당하라는 격려의 말씀이 있었습니다. 이번의 귀한 행사를 통해 연합회와 목사님들 간의 더욱 긴밀한 협력과 이해를 도모하는 기회가 되었으며 내년에는 더욱 발전된 행사가 되기를 기대해 봅니다. 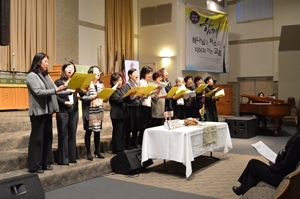 The New Jersey Korean United Methodist Church Pastors’ New Year service and banquet, which has been suspended for more than a decade, wrapped up beautifully with grace at the Bethany Church on February 19. Many pastors and wives were very delighted with the unexpected sincere service. 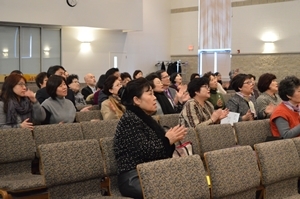 In the greetings by Pastor Il-Hyun Kim of Cherry Hill Church, the chairperson of the pastor's association, there were words of encouragement for the UMW members to serve God better through their dedication and service in each church. Through this precious occasion, we have had the opportunity to cooperate and understand more closely the relationship between the UMW and pastors, and we look forward to further development next year. 콘트라코스타 한인 연합 감리교회에서 진행되었습니다. 통하여 결코 혼자가 아니라 주안에서 하나 됨을 다시 한번 깨달으며 기쁨과 반가움속에 안부 인사가 오가는 우리의 모습은 참으로 아름다웠습니다. 서로의 마음의 문을 열고 감사의 기도를 드렸습니다. 열린 한인 연합 감리교회 담임 목사님이신 권혁인 목사님의 열정적인 강의가 시작되었습니다. 오늘 말씀의 주제인 “평화, 정의 그리고 생명”을 말씀을 토대로 여러 가지 예를 들어보이시며 우리의 영역을 터치해 주셨습니다. 세상 풍조에 휩쓸리기 쉬운 오늘날의 교회와 우리의 삶의 현장을 직시하며 표면적 평화가 아닌 정의로운 평화를 생각하는 시간이었습니다. 하나님이 주신 “샬롬”! , 온전함과 완전함, 하나님의 질서 속에서 이루어지는 평화와 정의의 공존을 창세기 말씀을 시작으로 열심히 우리의 시각과 생각과 마음에 하나님의 은혜를 전달해 주셨습니다. 정의로운 평화의 가능성을 강조하시면서 사랑은 정의와 평화를 공존하게 하는 힘이라고 말씀하시는 순간, 모든 문제의 정답을 깨닫게 되었습니다. 우리를 향한 주님의 사랑! 바로 그 사랑이었습니다. 우리가 그리스도를 따라 살아갈 때에 정의로운 평화를 이 세상에 만들어 갈 수 있다는 확신을 하게 되었습니다. 사랑이라는 거룩한 부담과 책임을 마음에 새기는 감동과 은혜의 시간 주심을 하나님께 감사드렸습니다. 모두 뜨거운 마음으로 주님이 주신 땅에서 온전하고 완전한 평화를 선포하며 나아가기를 결단하며 주님을 찬양했습니다. 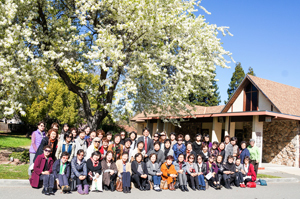 This is an announcement that the New Year Cal-Nevada Conference Korean UMW Network’s retreat was held on Saturday, February 17 at the Contra Costa KUMC. Even though we serve at different churches, we all live a life of faith. Through gathering like this, not isolated, but together in the presence of the Lord, we realize once again the unity, joy and gladness. It was very beautiful to see our greetings. Praise the Lord with all your heart and sincerity, confess that everything is the grace of the Lord we opened the hearts to each other and gave thanks to prayer. We started off with the Berkeley KUMC’s Senior Reverend, Pastor Kwon’s passionate lecture topic of "Peace, justice and life." Based on his words, he gave us various examples and touched our hearts. Facing today's church and our lives, which are likely to be touched by the winds of the world, it was time to think about just peace, not just superficial peace. God's "Shalom! ", wholeness and perfection, beginning with the words of Genesis, will drive us to work hard with a vision and thoughts. He has conveyed the grace of God to your heart.Rev. Kwon emphasized the possibility of a just peace and love as a force for justice and peace through coexistence. I was given the right answer. His love for us! That was the love. We follow Christ. I am confident that I will be able to make peace in this world. I thank the Lord for all the Holy burdens of love and the impression by grace of the Lord. Everyone, warmly, declare a perfect peace in the land the Lord has given us, as we praise the Lord with determination to go further. 늘 1월 중순에 하던 북일리노이 여선교회 연합회 헌신예배를 올해는 사정상 2월 첫 주에 하였습니다. 늘 해온 행사이긴 했어도, 제가 여선교회를 맡으며 하는 첫 예배이기 때문에 또한 시카고 날씨가 예측할 수 없기에 도움도 되지 않는 걱정을 많이 하기도 하였습니다. 설교를 해주신 신경혜 목사님을 11월부터 허락을 받은 덕에 나머지 성찬집례와 축도 등은 어렵지 않게 결정되었습니다. 흔쾌히 허락하신 목사님들께 감사를 드립니다. 눈보라가 치는 일기 가운데에서도, 멀리서 여선교 회원님들을 모시고 오신 목사님도 계셨고, 헌신예배 참석하시고자 1~2시간 운전도 마다 안하시고 와주신 여 교역자님들, 그 외 성도님들께 진심으로 감사를 드릴따름입니다. 무엇보다도 우리 여선교회 회원님들의 협조가 큰 몫을 하였습니다. 이자리를 빌어 헌신예배가 은혜스럽게 마칠 수 있었던 이유는 모든 회원님의 공으로 돌립니다. 찬양부터 영상, 음향, 친교 등 너무 열심히 도와주셔서 제가 은혜를 많이 받았습니다. 하나님께서는 불순한 일기를 허락하시면서도 그 안에서 저희를 선한 길로 인도하신다는 평범한 진리를 또 깨닫게 하셨습니다. 지난 2년간 부회장으로서 회장을 도우면서, 내가 많이 부족했구나 하는 깨달음 또한 허락하신 하나님께 정말 감사했습니다. 이제 2018을 맞아, 배우는 마음으로 부족한 저가 회장의 역할을 충실히 할 수 있게 해달라고 간절히 기도합니다. For reasons this year, we held a Northern Illinois KUMw dedication service in the first week of February, which was always held in mid-January. Even though it was my usual event, I had not-so-helpful worries since it was my first worship service as a leader of our network, and the weather in Chicago can not be predicted. 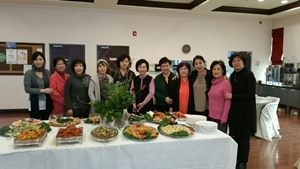 Thanks to the approval of pastor Gyeong-Hye Shin from November, we had no difficulties deciding the rest of the communion service and closing prayer. Thanks to the pastors who readily consented. Amid snowstorms there was a pastor who came from a distance with Missionary members and I would like to express my heartfelt gratitude to the church ministers and members who did not mind driving for 1-2 hours to attend the service. Above all, the cooperation of our members contributed greatly. I take this opportunity to thank all the members for their efforts to complete the service with grace. I was grateful for your help with praise, video, sound, fellowship, etc. God has allowed us to learn the ordinary truth that He leads us in the way of goodness, while allowing the bad weather to happen.While helping the president as a vice president for the past two years, I have been grateful to God for helping me to realize how inadequate I am. I sincerely pray that God would enable me to faithfully fulfill the role of the president with a learning heart in 2018. 뉴욕연합회의 임원과 회원 10명은 5월 18일-20일에 콜럼버스, 오하이오에서 실시될 Assembly에 참석하여 UMW 150주년 기념 축하공연을 할 예정이다. 한인여선교회에서 준비한 찬양과 소고춤이 있다. 특별히 한인여선교회는 김경옥 권사님(뉴욕베델 한인교회, 2017년 전국훈련 예전춤 인도자)의 예전춤도 함께 선보일 예정이다. 뉴욕연합회에서는 10명의 참가자가 매주 목요일에 모여 2시간씩 소고춤 연습을 하고 있는데 김경옥 권사님께서 믿음으로 가르치시는 예전춤이라 그런지 우리 모두에게 큰 감동을 주어 소고춤을 추는데 영적으로도 도전을 받고 있다. 미국 여선교회가 지난 150년 동안 뿌린 선교의 씨가 자라서 성장한 선교의 열매들이 펼치는 역사적인 150주년 축하행사는 그래서 더욱 의미가 깊다. The officers and members of the NYC KUMW Network will be performing at the UMW Assembly which will be held on May 18th -20th in Columbus, Ohio. 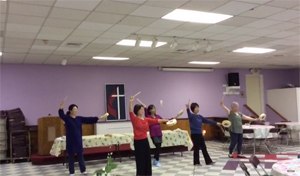 Also at this occasion, Kyung Ok Kim from the NY Bethel Korean church will be performing a Korean traditional dance designed for Christian worship service. 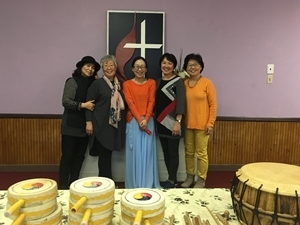 To prepare for the UMW Assembly, 10 members from the NYC KUMW will get together to practice every Thursday for two hours under the leadership of Kyung Ok Kim who dedicates her time and energy with commitment. Her faith in action encourages us and at the same time challenges us. It is more meaningful to have the 150th historical celebration of UMW with us involved; the seed of 150 years of its mission work with dedication and commitment for women around the world. We all are blessed by this great gathering for the celebration of the 150th year of UMW. 독서프로그램은 UMW의 아름다운 전통이다. 그 전통은 감리교회 창시자인 요한 웨슬리 목사님께서 기독교인들은 성경 외에 좋은 신앙 서적을 읽어야 한다고 주장한 데서 유래한다. 한인여선교회 전국연합회는 2007년부터 UMW 안에서 한국어 독서프로그램을 시작하게 되었다. 한국어 독서프로그램은 3가지 유익을 제공해 준다. 1. 영적성장, 선교교육, 공동체 양육, 사회참여, 지도력 개발과 같은 5가지 카테고리에 맞게 선정된 한국어책들을 여선교회 회원들에게 소개해준다. 2. 미국 UMW의 독서프로그램 안에서 한국어책들이 선정되어 UMW가 추구하는 다양한 인종을 존중하는 사역에 협력하는 동반자가 되고 있다. 3. 독서프로그램도 여선교회 목적문에 명시된 선교의 개념을 넓히는 귀한 도구가 되고, 선교교육의 일환이 된다. 2018년 독서프로그램에서 선정된 책 중에서 이번 달에는 영적 성장을 위해 선정된 ‘하나님의 임재’ 라는 책을 소개한다. 이 책은 2013년 산타바바라에서 열린 집회의 강연을 책으로 묶은 것이다. 달라스 윌라드와 존 오트버그와의 대화를 통해서 달라스 윌라드는 하나님 나라 복음과 제자도의 핵심을 정리해 주었다. 저자는 우리가 지금, 여기에서 하나님 나라를 누리며 사는 법을 말해준다. 누구든지 그리스도의 제자가 되고 그분의 임재를 알아차리면 지금 그 나라를 누리며 살 수 있다. 우리가 있는 자리에서 하나님이 무슨 일을 하고 계시는지 알게 되고, 하나님의 일에 동참할 수가 있다. 이런 삶을 위해 저자는 영적 훈련의 중요성과 훈련의 장이자 축복의 통로로서 교회와 목회의 역할에 대한 충고도 아끼지 않는다. The Reading Program is a meaningful tradition for UMW. It was started by John Wesley who is the founder for the United Methodist Church. He advocated for reading religious books on top of studying the Bible. The Korean UMW implemented the Reading Program in 2007. There are 3 benefits to the Korean Reading Program. It introduces 5 categories of books including spiritual growth, missional education, community ministries, social participation, and leadership development. Korean books are chosen from the UMW Reading Program which pursues the Diversity, therefore we can be a cooperative partner. The Reading Program is used to expand and educate our missional purpose. Please encourage your regional group members to read the books recommended by the Reading Program. 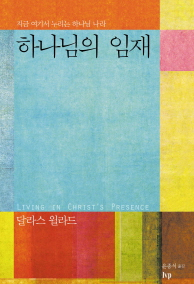 Among the books chosen by the Reading Program in 2018, this month recommendation is titled “Living in Christ’s Presence” by Dallas Willard. This book is adapted from talks given at the 2013 conference in Santa Barbara. Through the illuminating dialogue between Ortberh and Willard, this book points out the true gospel and discipleship very well. The author explores what it means to live well now in the light of God’s kingdom. It is possible to enjoy God’s kingdom when you are in his presence right here, right now. He reflects on the power of God in our lives, the meaning of knowledge, and the importance of spiritual disciplines. The book closes with the theme, of offering a blessing to one another, especially for church’s role as passageway towards blessing. 종교개혁 500주년: 여성, 평신도에게 길을 묻는다! 2017년은 종교개혁 500주년을 맞이하는 해이다. 세계곳곳의 교회와 기관들에서 종교개혁 500주년에 대한 학술강연회, 세미나, 예배, 등이 이루어지고 있다. 그런데 뉴욕의 후러싱교회에서 매달 수요일마다 종교개혁 500주년을 기념하여 세미나를 하고 계시는데 이 행사에 평신도 여성의 입장에서 강사로 초대받아 이 자리에 서게 되어 영광이다. 초청해 주신 김정호 담임목사님과 성도들께 감사를 드린다. 종교개혁 500주년은 다양한 의미를 갖고 있지만 평신도 여성의 관점에서 보고자 한다. 독일의 종교개혁자 마틴 루터는 1520년에 그의 저서 “독일 기독교 귀족들에게 고함”에서 만인제사장설을 주장하였다. 만인제사장설 교리는 "모든 신자는 그가 성직자이든 아니든 상관없이 누구나 예수 그리스도를 통하여 직접 하나님께 나아가 예배하며 교제할 수 있다"이다. 모든 기독교인은 제사장의 자격으로 자신의 직업을 통해서 하나님의 부르심에 응답해야 한다는 것이다. 결국 모든 그리스도인은 하나님으로부터 소명을 받아 동등한 권리를 가지고 있으며, 단지 직분에 따라 그 역할의 차이가 있을 뿐이라는 것을 말하였다. 이러한 만인제사장설은 개신교 형성에 지대한 영향을 끼치게 되었고 오늘날 교회와 사회에서 평신도들이 소명을 받아 자신의 재능을 기부하며 사역을 할 수 있게 되었다. 그러면 오늘날 우리 한인교회와 여성들은 어떠한가? 연합감리교회 여선교회 목적문에 보면 “예수그리스도를 통하여 온전한 자유를 체험하고”라는 말이 있다. 우리가 예수님을 만나고 그 말씀대로 살면 진정한 자유를 누리며 산다는 것이다. 그런데 한인교회 여성들은 그런 자유를 누리고 있는가? 아쉽게도 내가 지난 30년간 교회의 여선교회 사역을 하면서 만난 수많은 여성들은 그런 자유를 누리고 있지 못했다. 많은 여성이 교회에 오면 자신의 소리를 내지 못하고 눈치를 보는 경우가 많다. 1세 한인 여성들은 유교 문화 속에서 성장해서 어릴 적부터 가정과 학교에서 여성은 이렇게 해야 한다는 지정된 교육을 받아왔고, 연장자에게 복종해야 한다는 장유유서의 사상으로 연령차별을 경험하였다. 교회에선 “여자는 잠잠해야 한다”는 남성 위주의 성서해석으로 여성들은 차별을 받아왔다. 그래서 교회에서 역할은 부엌에서 밥 만들기, 주일학교교사, 성가대에 활동으로 제한되어왔고, 교회의 운영과 사역을 결정하는 기구에 의장으로 활동하기 어렵고, 직분 제도에서 여자 장로가 선출된다는 것은 너무도 어렵고 지금도 그런 교회들이 많다. 또한, 한인여성들은 미국 사회에서 언어와 문화의 장벽 속에서 인종차별의 아픔을 겪고 있다. 과거부터 지금까지 한인 여성들이 경험하고 있는 성차별, 연령차별, 인종차별의 삼중고는 예수님은 우리에게 진정한 자유를 주었지만, 여성들은 그 진정한 자유함을 온전하게 누리지 못하 게 하는 원인이 되고 있다. 그래서 한인교회는 다음과 같이 4가지의 결과를 파생하고 있다. 첫째, 우리의 딸들인 한인 2세 여성들이 한인교회로부터 멀어져가고 있다. 집에서 아버지의 가부장적 권위의 모습을, 교회에서 남성 목회자와 남성 교인들의 권위적 모습을 보면서 교회를 떠나는 사례가 많고, 심지어는 한인 남성과의 결혼을 꺼리게 된다는 고백도 들은 적이 많다. 둘째, 사회에서 전문직에 종사하는 한인 여성들이 교회에 와서 자신의 목소리를 당당하게 낼 수 없고 자신의 능력을 인정받지 못하는 교회구조에서 실망하고 교회를 떠나가고 있다. 그런 여성들은 교회에 가면 가슴이 답답하다고 고백하는 것을 여러 번 들었다. 셋째, 교회 여성들이 가정과 교회 위주로만 삶의 자리가 정해져 있어서 미국 사회와 급변하는 세계정세를 잘 파악하지 못하고 마치 섬에서 사는 사람들 같다는 생각이 들 때가 많다. 그결과 자녀들과 언어와 문화에서 오는 대화의 단절과 세대 차를 경험하는 여성들이 많다. 넷째, 여성들을 위한 지도자 교육의 부재로 교회 여성들 안에서 시기와 질투, 그리고 반목으로 많은 갈등이 일어나서 한인교회가 발전하지 못하는 큰 요인이 되기도 한다. 그럼 종교개혁 500주년을 맞아 평신도 여성들이 나가야 할 방향은 무엇인가? 연합감리교인의 입장에서 제시해 보고자 한다.
. 교회는 웨슬리의 전통을 갱신해야 한다. 감리교 운동을 시작한 웨슬리의 신학과 삶은 전 세계 많은 사람에게 감명을 주어 남성과 여성 영적 지도자들과 사회개혁의 지도자들을 배출해 내었다. 한인교회는 영적인 훈련은 많다. 그러나 은혜의 하나님 안에서 같이 사는 세상을 향한 경건의 사역 – 사회를 향한 자비 사역이 너무도 부족하다. 개인의 영성과 사회 영성의 균형이 필요하다. .교회의 조직과 사역에 능력별로 재능있는 여성들을 배치하고 인정해야 한다. 교회에서 여성들이 자신감을 가지며, 성차별, 연령차별을 받지 않도록 의도적으로 제도를 마련해야 한다. 교회 직분 제도와 각 위원회에 남성과 여성의 비율을 정해서 선출해야 한다. .2세 한인 여성들을 지도자로 양성해야 한다. 한인교회에서 엄마와 딸들이 함께 할 수 있는 프로그램을 개발하여 실시하며, 2세 한인 여성들을 위한 영성훈련과 지도자훈련들을 마련해서 실시한다. 프로그램에 자율성을 주어서 연령 차별 없이 그들 스스로가 준비위원이 되어 프로그램을 만들어 내도록 유도하고 돕는다. .한인 여성 목회자들을 양성하고 한인교회에서 사역할 수 있도록 해야 한다. 현재 미국연합감리교회에 한인 목회자가 750여 명이 있는데 그중에 450여 명이 미국교회를 목회하는 목회자이며, 한인교회를 담임하는 남성 목회자가 300여 명이다. 특별히 미국교회를 목회하는 한인 목회자 중에서 여성 목회자가 190여 명 된다. 하지만 한인교회를 담임하는 여성 목회자는 미 전국에 4명밖에 없으며 거의 미국 백인교회나 타인종 교회에서 목회자로 사역을 하고 있다. 그렇다면 앞으로 2세 한인 여성 목회자들이 배출되어도 그들이 한인교회로 파송을 받을 수 있을까? 또한, 한인교회 교인의 반 이상이 여성이다. 많은 숫자의 여성 성도들을 위해서 여성 목회자는 반드시 필요하다. .여성들의 시각에서 보는 여성 성경공부와 다양한 지도자 교육을 실시해야 한다. 여성 목회자들이 한인교회에 초빙이 안 되거나 한인교회에서 사역이 어려운 점은 같은 여성들이 갖고 있는 부정적인 의식 때문이다. 그래서 교회에서 여성들을 위한 다양한 지도자 교육이 실시되면 여성들이 가진 시기와 질투가 건전한 에너지로 바뀌게 되고, 지도자의 어려움을 알게 되며, 여성이 여성을 돕는 동역자들이 될 것이다. .연합감리교회 여선교회 사역에 함께 해야 한다. 연합감리교회 여선교회는 웨슬리의 감리교 운동의 정신을 이어받아 수산나 웨슬리의 부엌에서 시작하여 오늘까지 이어진 믿음의 여성공동체이다. 또한, 한인 여선교회는 미국 여선교회의 선교의 열매들이다. 오늘날 세계의 문화는 네트워킹을 통해서 서로가 나누고 성장을 도모한다. 미국 이민자로 살아가는 한인 여성들은 Korean-American으로서 신앙적으로 문화적으로 – (하이픈)의 역할을 감당해야 하는 사명이 있다. 그런 사명을 감당하려고 2003년 미국에서 한인여선교회 전국연합회가 조직되어 국내에선 300개 한인연합감리교회 여선교회 회원들의 지도자훈련과 해외에선 미국 여선교회와 연대하여 아시아 전도부인사역을 실시하고 있다. 한인 여성들이 오랫동안 세계의 여성과 아동과 청소년을 위해 사역해온 미국 여선교회의 영성과 교육방법, 자료, 등을 함께 나누고, 함께 배우면, 함께 성장하게 될 것이다. 그러면 한인여성들은 이 땅에 뿌리를 내려가는 우리의 자녀들을 위해 어떠한 차별도 받지 않도록 다리가 돼줄 수 있다고 생각한다. .여성들 스스로 사명자로서 책임감을 가져야 한다. 역사적으로 보면 여성의 권리는 여성이 스스로 찾고 지켜왔다. 여성들의 안일함과 현실 안주가 가장 큰 적이 된다. 우리 신앙의 선배들은 환경을 탓하지 않고 목숨을 내놓고 새로운 것을 창조하였으며, 종교와 문화를 넘어서 오늘 우리에게 교회를 물려주었다. 그분들의 희생과 헌신이 있었기에 오늘 우리가 이 자리에 있는 것이다. 우리는 신앙의 빚진 자들이다. 그렇다면 우리 한인 여성들은 어떤 교회의 미래를 우리의 후배들과 딸들에게 물려줄 것인가? 우리는 이러한 역사적인 책임감을 가져야 한다. 또한, 나를 불러주시고 나를 하나님의 자녀 삼아주시고 오늘날까지 나와 함께 해 주신 하나님이 나에게 바라시는 목적이 무엇인지를 찾아야 한다. 그것은 내가 가진 재능을 가지고 교회를 통해서 그리고 사회에 나가서 하나님 나라를 넓혀가는 사명자가 되는 것이다. 하나님은 가장 약한 자를 들어서 강한 자를 부끄럽게 하시는 분이다. 가장 약한 여성을 사용하셔서 큰 역사를 이루어내셨고 오늘도 이루어가고 계심을 믿어야 한다. 500년 전 종교개혁을 통해서 평신도 특별히 여성들에게 소명을 가지고 역사 안에서 사명자와 사역자로 살 수 있는 통로를 열어주신 하나님께 감사드린다. How is the Korean Church and its Women Today? There is a saying in the purpose of UMW saying, “to experience freedom as whole persons through Jesus Christ.” When we met Jesus Christ and live according to His Word, we will experience freedom in life. Do we as Korean women of the church experience this freedom in living? Having met many church women in the past 30 years, reluctantly I can say that most of us do not experience the freedom in Christ. Many of us are not able to voice our beliefs, thoughts, and opinions in the church. We, as the first generation of Koreans in America, grew up in a Confucian influenced society back in Korea. We were educated at schools and at home on how to behave, how to think, and how to “properly” appear to others, especially to elders whom we must submit and automatically respect. Even in churches we were taught “women should be silent” based on the interpretation of the bible, mostly by the male preachers. The results of this kind of discrimination gave women limited activities – either in the kitchen preparing for lunch or dinner, teaching in Sunday school, or singing in the choir. Women in the church were rarely involved in the administrative aspects or decision-making processes in church. Women were hardly elected as officers in the church system. Not only were Korean women discriminated against in churches, but also in society where they experienced hardships due to the language barrier and cultural differences. From the past to the present, Korean women experienced discrimination against sexism, ageism, and racism. This results in blocking us from experiencing the true freedom that Jesus Christ gives us. Following four factors are the results derived from the Korean church. (1) Our daughter’s generation is staying away from churches. The reasons are, from home, they experienced their fathers’ male oriented authority, and from churches, they see male pastors, elders of their authoritative attitude. Furthermore, I heard that some Korean-American young women prefer not to marry Korean males. 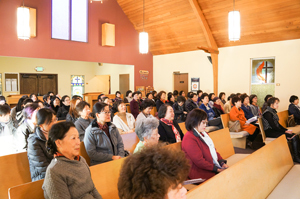 (2) Professional Korean-American women often experience that they cannot voice their own opinions, and their talents are not often acknowledged in the church system, which causes them to leave church. (3) The first-generation women’s boundaries are limited to their homes, work places, and churches. Therefore, their ignorance of the American culture and its fast-changing society, which they cannot keep up with, causes a lack of communication with their own children and widens the generation gap. (4) One of the reasons that churches have conflicts is because the women members of the church. Their jealousy and envy cause many quarrels, due to the absence of leadership training for them. 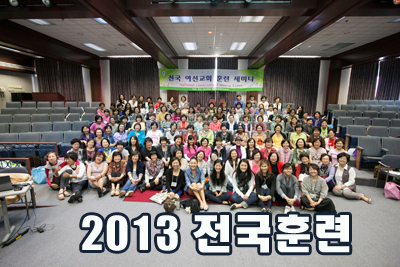 Then what will be the direction of women laity of the Korean church as we celebration 500 years of the Reformation. I would like to suggest these following ideas as a member of the KUMC. 1. The church needs to renew the tradition of Wesley. The Methodist movement started by John Wesley made a deep impression on many people and produced many spiritual leaders of men and women. The Korean church emphasizes a great deal in personal piety and spiritual growth, but they lack the mercy ministry of social holiness that requires active participants in God’s activity in the world through missions and services. 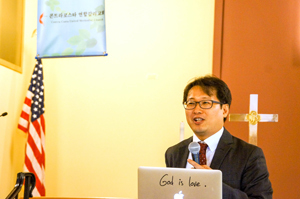 The Korean church needs balance between the personal piety and the social holiness. 2. The church needs to place more women in the church who have talents and abilities in its organizations and in its ministries. Intentionally the church must make a system that encourages women to participate in its decision-making body without any discrimination against women or their age. The church needs to elect committee chairs and church officers according to a fair ratio between male and female members. 3. 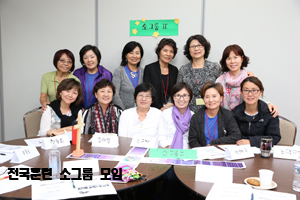 The church needs to provide leadership trainings for the second generation of Korean-American women. The church needs to develop and implement the programs for the mother and daughter who can participate together. Also, it needs to provide spiritual and leadership training for the second generation of Korean-American women. It would be great to see that church provides the atmosphere for the second generation to come together to make a committee of their own to make programs according to their needs. 4. The church should encourage Korean women to be ministers. 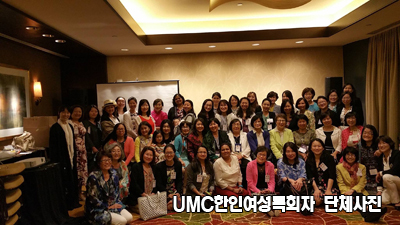 Presently there are 750 Korean ministers in the UMC, and 450 are appointed to the English-speaking churches and 300 male ministers are ministering in Korean speaking churches. Among the 450 ministers in the English-speaking congregation, there are 190 women ministers. Surprisingly there are only 4 women ministers in Korean church. Other women ministers are serving in either English speaking white congregations or ministering to other racial background churches. 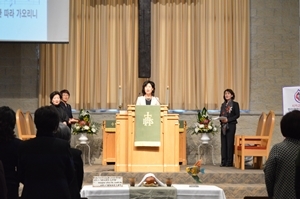 If so, is it possible for the second generation of Korean-American women ministers to be appointed to Korean churches? 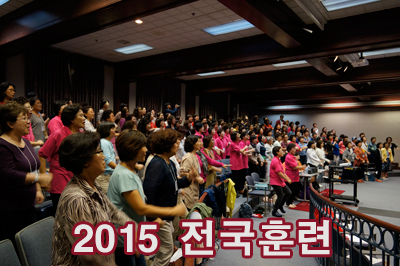 More than half of the Korean congregations are women. This means Korean churches desperately need women ministers. 5. The church needs to provide the bible studies that bring out the woman’s point of views, and it needs to provide the variety of leadership training for the women in the church. 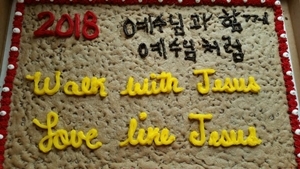 One of the reasons that Korean churches have a difficult time accepting women ministers are because of the woman members of the church. They have a negative attitude toward woman ministers, even though they have no experience having a woman as their minister. That is why we need a variety of leadership training for the women to help change their envy and jealously to positively bring awareness and understanding of the ministers’, especially the women ministers’, role. This will bring the women of the church in partnership with women ministers in the ministry of the church. 6. The church needs to be with United Methodist Women and its ministries. It is based on spirit of Wesley’s Methodism, and started from Suzanna Wesley’s kitchen and came to us today as a largest woman’s group based on faith in Jesus Christ. 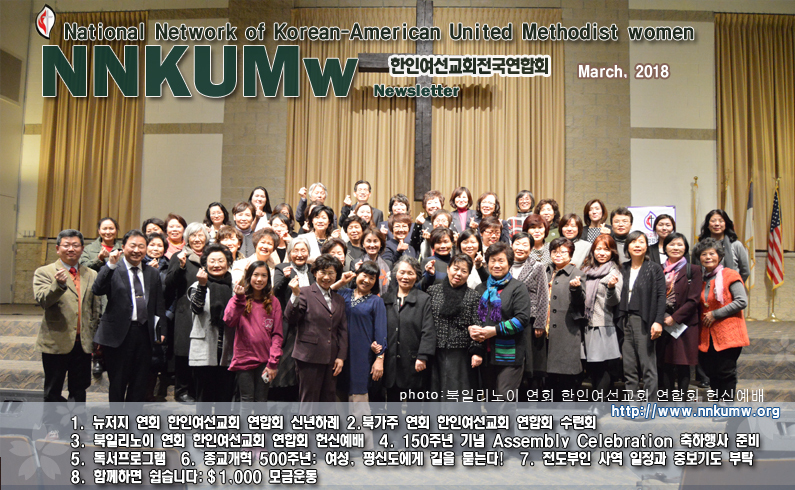 Also, we, the Korean UMW, are the fruit of UMW’s mission work. In today’s world we exchange information through networking to learn, to develop, and to grow. As Korean-American women living in the USA as immigrants, we have a role to carry out the mission works faithfully and culturally. 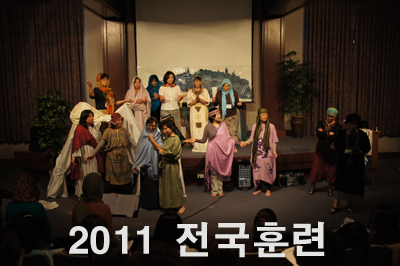 So in order to carry out the mission, the National Network of Korean United Methodist Women(NNKUMW) was formed in 2003. 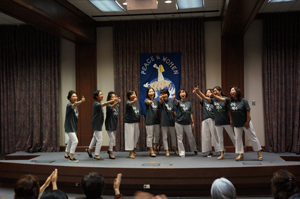 It provides leadership training on a regular basis for the members of KUMW for 300 churches in the States, and in partnership with UMW, the NNKUMW carries out the Bible Women mission work in Asia. We are committed to learn, to share, to grow, and to work together with UMW which has had a long history of mission works for women, children and youth nationally and internationally. Through our commitment in God’s mission, perhaps we as KUMW will be used as an instrument for leading Korean churches to have any form of a non-discriminative environment for our next generation. 7. 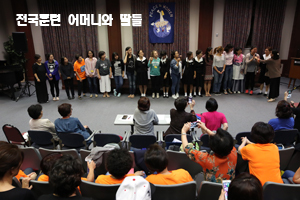 The women of the Korean church should be aware of the responsibilities as missionaries. Throughout history, the woman’s rights have been claimed by women and kept by women. The women’s enemies are not the men, but our idleness and staying in the comfort zone. Our predecessors committed their lives to bring new possibilities for women, children and youth by overcoming hard environments, unfamiliar cultures and religions. Amid their hardships they inherited us what is called ‘church’. We would not be here today without their commitments and sacrifices. We are debtors in faith. If so, as Korean women believers, what visions do we have for the church and for the future generations? To realize historical backgrounds of our predecessors and our present responsibilities for the future generations are very important issues. But most importantly we as women need to find out our purpose in life in terms of our relationship with God who has called us as His children and promised to be with us. It is a very crucial task. But the most important realization for us is to use our God given talents for the church as well as for the neighbors around us to broaden the kingdom of God. God uses the weak to shame the strong. And God calls us, the weakest of all, to carry His mission. And we know that God is working through us to bring forth His kingdom on earth. To God be the glory, who continues to call us and give us visions to live our lives as missionaries and ministers of His kingdom. 유라시아 기독여성훈련이 3월 26일부터 28일 까지 하바롭스크, 러시아에서 실시될 예정입니다. 팀들은 3월23일 출발해서 29일 돌아오는 일정입니다. 1. We pray for the health, safety, and successful travel of all the participating team members, Sung-Eun Lee (NNKUMw President), Myung-Rae Kim (Executive director), Ohyeun K Lee (Assistant executive director), Elena(UMW staff in Russia), Sea Kim (Intern, Scranton Women’s Leadership Center in Korea). 2. Ask the Lord to move the hearts of the members participating in the Khabarovsk training in Russia. 3. Pray for all mission team members to have Khabarovsk in their mind and to serve in Eurasia. 4. Pray that they will be armed with the Word of God and prayers to win the spiritual battle. 5. Pray that the NNKUMw to move toward missionary enthusiasm.